Moving and lifting heavy materials doesn't have to involve installing expensive equipment or permanently changing your facility. 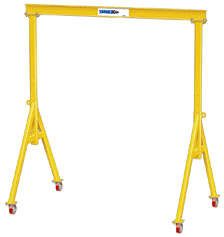 No permanent installation required, making Gantry Cranes ideal if you rent or lease your facility. Portable design allows for relocation for use in more than one facility or work area. 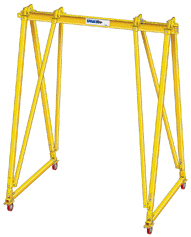 Gantry construction incorporates standard American I-beams. All nuts, bolts, and pins are plated for corrosion resistance. 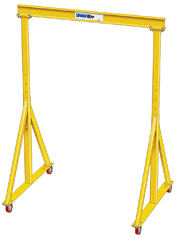 All Gantry Cranes are painted Safety Yellow. 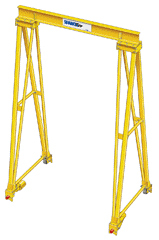 Ace Crane offers a complete line of Gantry Cranes to fit almost any application. Please contact our office for a detailed quotation. Height Under Beam of 10'-0"
Height Under Beam of 14'-0"